Вы можете вызвать квалифицированного сантехника www.l-santehnik.ru. Benjamin Franklin (January 17, 1706 – April 17, 1790) was one of the most prominent of Founders and early political figures and statesmen of the United States. Considered the earliest of the Founders, Franklin was noted for his curiosity, ingenuity and diversity of interests. His wit and wisdom is proverbial to this day. More than anyone else, he shaped the American Revolution despite never holding national elective office. As a leader of the Enlightenment he had the attention of scientists and intellectuals all across Europe. As agent in London before the Revolution, and Minister to France during, he more than anyone defined the new nation in the minds of Europe. His success in securing French military and financial aid was decisive for American victory over Britain. He invented the lightning rod; he was an early proponent of colonial unity; historians hail him as the "First American". 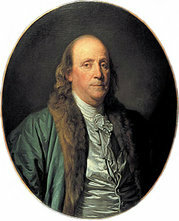 The city of Philadelphia, Pennsylvania marked Franklin's 300th Birthday in January 2006 with a wide array of exhibitions, and events citing Franklin's extraordinary accomplishments throughout his illustrious career. Born in Boston, Massachusetts to a tallow-maker, Franklin became a newspaper editor, printer, and merchant in Philadelphia, becoming very wealthy. He spent many years in England and published the famous Poor Richard's Almanack and Pennsylvania Gazette. He formed both the first public lending library and fire department in America as well as the Junto, a political discussion club. He became a national hero in America when he convinced Parliament to repeal the hated Stamp Act. A diplomatic genius, Franklin was almost universally admired among the French as American minister to Paris, and was a major figure in the development of positive Franco-American relations. From 1775 to 1776, Franklin was Postmaster General under the Continental Congress and from 1785 to his death in 1790 was President of the Supreme Executive Council of Pennsylvania. Franklin was interested in science and technology, carrying out his famous electricity experiments and invented the Franklin stove, medical catheter, lightning rod, swimfins, glass harmonica, and bifocals. He also played a major role in establishing the higher education institutions that would become the Ivy League's University of Pennsylvania and the Franklin and Marshall College. In addition, Franklin was a noted linguist, fluent in five languages. He also practiced and published on astrology (see Poor Richard's Almanac). Franklin was also noted for his philanthropy and several extramarital liaisons, including that which produced his illegitimate Loyalist son William Franklin, later the colonial governor of New Jersey. Towards the end of his life, he became one of the most prominent early American abolitionists. Today Franklin is pictured on the U.S. $100 bill. Franklin's father, Josiah Franklin, was born at Ecton, Northamptonshire, England on December 23, 1657, the son of Thomas Franklin, a blacksmith and farmer, and Jane White. His mother, Abiah Folger, was born in Nantucket, Massachusetts on August 15, 1667, to Peter Folger, a miller and schoolteacher, and his wife Mary Morrill, a former indentured servant. Around 1677, Josiah married Anne Child at Ecton, and over the next few years had three children. These half-siblings of Benjamin Franklin included Elizabeth (March 2, 1678), Samuel (May 16, 1681), and Hannah (May 25, 1683). Sometime during the second half of 1683, the Franklins left England for Boston, Massachusetts. While in Boston, they had several more children, including Josiah Jr. (August 23, 1685), Ann (January 5, 1687), Joseph (February 5, 1688), and Joseph (June 30, 1689) (the first Joseph having died soon after birth). Josiah's first wife Anne died in Boston on July 9, 1689. He was later remarried to a woman called Abiah on November 25, 1689 in the Old South Church of Boston by the Rev. Samuel Willard. They had the following children: John (December 7, 1690), Peter (November 22, 1692), Mary (September 26, 1694), James (February 4, 1697), Sarah (July 9, 1699), Ebenezer (September 20, 1701), Thomas (December 7, 1703), Benjamin (January 17, 1706), Lydia (August 8, 1708), and Jane (March 27, 1712). Benjamin Franklin was born on Milk Street in Boston, Massachusetts on January 17, 1706. His father, Josiah Franklin, was a tallow chandler, a maker of candles and soap, whose second wife was Benjamins' mother. Josiah's marriages produced 17 children; Benjamin was the tenth and youngest son. He attended Boston Latin School but did not graduate. His schooling ended at ten, then worked for his father, and at 12 he became an apprentice to his brother James, a printer who published the New England Courant, the first truly independent newspaper in the colonies. While a printing apprentice, he wrote under the pseudonym of 'Silence Dogood' who was ostensibly a middle-aged widow. His brother and the Courant's readers did not initially know the real author. James was not impressed when he discovered his popular correspondent was his younger brother. Franklin left his apprenticeship without permission and in so doing became a fugitive. At the age of 17, Franklin ran away to Philadelphia, seeking a new start in a new city. When he first arrived he worked in several printer shops around town. However, he was not satisfied by the immediate prospects. After a few months, while working in a printing house, Franklin was induced by Pennsylvania Governor Sir William Keith to go to London, ostensibly to acquire the equipment necessary for establishing another newspaper in Philadelphia. Finding Keith's promises of backing a newspaper to be empty, Franklin worked as a compositor in a printer's shop in what is now the Church of St Batholomew the Great, Smithfield. Following this, he returned to Philadelphia in 1726 with the help of a merchant named Thomas Denham, who gave Franklin a position as clerk, shopkeeper, and bookkeeper in Denham's merchant business. Upon Denham's death, Franklin returned to his former trade. By 1730, Franklin had set up a printing house of his own and had contrived to become the publisher of a newspaper called "The Pennsylvania Gazette". The Gazette gave Franklin a forum for agitation about a variety of local reforms and initiatives through printed essays and observations. Over time, his commentary, together with a great deal of savvy about cultivating a positive image of an industrious and intellectual young man, earned him a great deal of social respect. Even after Franklin had achieved fame as a scientist and statesman, he would habitually sign his letters with the unpretentious 'B. Franklin, Printer'. Franklin was initiated into the local Freemason lodge in 1730-1731, and became grand master in 1735, indicating his rapid rise to prominence in Philadelphia. He remained a Freemason for the rest of his life. In 1724, while a boarder in the Read home, Franklin had courted Deborah Read before going to London at Governor Keith's request. At that time, Miss Read's mother was wary of allowing her daughter to wed a seventeen-year old who was on his way to London. Her own husband having recently died, Mrs. Read declined Franklin's offer of marriage. While Franklin was finding himself in London, Deborah married a man named John Rodgers. This proved to be a regrettable decision. Rodgers shortly avoided his debts and prosecution by fleeing to Barbados, leaving Deborah behind. With Rodgers' fate unknown, and bigamy an offense punishable by public whipping and imprisonment, Deborah was not free to remarry. Franklin himself had his own actions to ponder. In 1730, Franklin acknowledged an illegitimate son named William, who eventually became the last Loyalist governor of New Jersey. While the identity of William's mother remains unknown, perhaps the responsibility of an infant child gave Franklin a reason to take up residence with Deborah Read. William would be raised in the Franklin household but eventually broke with his father over the treatment of the colonies at the hands of the crown, but was not above using his father's notoriety to enhance his own standing. Franklin established a common law marriage with Deborah Read on September 1, 1730. At a time when many colonial families consisted of six or more children, Benjamin and Deborah Franklin eventually had two (in addition to raising William). The first was Francis Folger Franklin, born October 1732. In one of the most painful moments of Franklin's life, the boy died of smallpox in the fall of 1736. A daughter, Sarah Franklin, was born in 1743. She eventually married a man named Richard Bache, had seven children, and cared for her father in his old age. Deborah's fear of the sea meant that she never accompanied Franklin on any of his extended trips to Europe, despite his repeated requests. Franklin was a prodigious inventor. Among his many creations were the Armonica, the Franklin stove, Bifocal glasses, and the Catheter. Franklin believed in the free exchange of ideas, and never patented any of his inventions. In 1743, Franklin founded the American Philosophical Society to help scientific men discuss their discoveries. He began the electrical research that, along with other scientific inquiries, would occupy him for the rest of his life (in between bouts of politics and money-making). In 1748, he retired from printing and went into other businesses. He created a partnership with his foreman, David Hill, which provided Franklin with half of the shop's profits for 18 years. This lucrative business arrangement provided leisure time for study, and in a few years he had made discoveries that gave him a reputation with the learned throughout Europe and especially in France. These include his investigations of electricity. Franklin proposed that "vitreous" and "resinous" electricity were not different types of "electrical fluid" (as electricity was called then), but the same electrical fluid under different pressures (See electrical charge). He was the first to label them as positive and negative respectively, and the first to discover the principle of conservation of charge. In 1750, he published a proposal for an experiment to prove that lightning is electricity by flying a kite in a storm that appeared capable of becoming a lightning storm. On May 10, 1752, Thomas Francois d'Alibard of France conducted Franklin's experiment (using a 40-foot-tall iron rod instead of a kite) and extracted electrical sparks from a cloud. On June 15, Franklin conducted his famous kite experiment and also successfully extracted sparks from a cloud (unaware that d'Alibard had already done so, 36 days earlier). Franklin's experiment was not written up until Joseph Priestley's 1767 History and Present Status of Electricity; the evidence shows that Franklin was insulated (not in a conducting path, as he would have been in danger of electrocution in the event of a lightning strike). (Others, such as Prof. Georg Wilhelm Richmann of St. Petersburg, Russia, were spectacularly electrocuted during the months following Franklin's experiment.) In his writings, Franklin indicates that he was aware of the dangers and offered alternative ways to demonstrate that lightning was electrical, as shown by his use of the concept of electrical ground. If Franklin did perform this experiment, he did not do it in the way that is often described (as it would have been dramatic but fatal). Instead he used the kite to collect some electric charge from a storm cloud, which implied that lightning was electrical. Franklin's electrical experiments led to his invention of the lightning rod. He noted that conductors with a sharp rather than a smooth point were capably of discharging silently, and at a far greater distance. He surmised that this knowledge could be of use in protecting buildings from lightning, by attatching "upright Rods of Iron, made sharp as a Needle and gilt to prevent Rusting, and from the Foot of those Rods a Wire down the outside of the Building into the Ground;.Would not these pointed Rods probably draw the Electrical Fire silently out of a Cloud before it came nigh enough to strike, and thereby secure us from that most sudden and terrible Mischief!" Following a series of experiments on Franklin's own house, lightning rods were installed on the Academy of Philadelphia (later the University of Pennsylvania) and the Pennsylvania State House (later Independence Hall) in 1752. In recognition of his work with electricity, Franklin received the Royal Society's Copley Medal in 1753, and in 1756 he became one of the few eighteenth century Americans to be elected as a Fellow of the Society. The cgs unit of electric charge has been named after him: one franklin (Fr) is equal to one statcoulomb. On October 21, 1743, a storm blowing from the north-east denied Franklin the opportunity of a witnessing a lunar eclipse. In correspondance with his brother, Franklin learned that the same storm had not reached Boston until after the eclipse, despite the fact that Boston is to the north-east of Philadelphia. He deduced that storms do not always travel in the direction of the prevailing wind, a concept which would have great influence in meteorology. Franklin noted a principle of refrigeration by observing that on a very hot day, he stayed cooler in a wet shirt in a breeze than he did in a dry one. To understand this phenomenon more clearly Franklin conducted experiments. On one warm day in Cambridge, England in 1758, Franklin and fellow scientist John Hadley experimented by continually wetting the ball of a mercury thermometer with ether and using bellows to evaporate the ether. With each subsequent evaporation, the thermometer read a lower temperature, eventually reaching 7 °F (-14 °C). Another thermometer showed the room temperature to be constant at 65 °F (18 °C). In his letter "Cooling by Evaporation," Franklin noted that "one may see the possibility of freezing a man to death on a warm summer’s day. Public life Franklin and several other members of a philosophical association joined their resources in 1731 and began the first public library in Philadelphia. The newly founded Library Company ordered its first books in 1732, mostly theological and educational tomes, but by 1741 the library also included works on history, geography, poetry, exploration, and science. The success of this library encouraged the opening of libraries in other American cities, and Franklin felt that this enlightenment partly contributed to the American colonies' struggle to maintain their privileges. In 1736 Franklin created the Union Fire Company, the first volunteer firefighting company in America. In the same year he printed a new currency for New Jersey based on innovative anti-counterfeiting techniques which he had devised. As he matured, Franklin began to concern himself more with public affairs. In 1743, he set forth a scheme for The Academy and College of Philadelphia. He was appointed President of the Academy in November 13, 1749, and it opened on August 13, 1751. At its first commencement, on May 17, 1757, seven men graduated; six with a Bachelor of Arts and one as Master of Arts. It was later merged with the University of the State of Pennsylvania, to become the University of Pennsylvania, today a member of the Ivy League. In 1753, both Harvard and Yale awarded him honorary degrees. In 1751, Franklin and Dr. Thomas Bond obtained a charter from the Pennsylvania legislature to establish a hospital. Pennsylvania Hospital was the first hospital in what was to become the United States of America. Franklin became involved in Philadelphia politics, and progressed rapidly. In October 1748 he was selected as a councilman, in June 1749 he became a Justice of the Peace for Philadelphia, and in 1751 he was elected to the Pennsylvania Assembly. On August 10, 1753 Franklin was appointed joint deputy postmaster-general of North America. His most notable service in domestic politics was his reform of the postal system, but his fame as a statesman rests chiefly on his subsequent diplomatic services in connection with the relations of the colonies with Great Britain, and later with France. In 1754 he headed the Pennsylvania delegation to the Albany Congress. This meeting of several colonies had been requested by the Board of Trade in England to improve relations with the Indians and defense against the French. Franklin proposed a broad Plan of Union for the colonies. While the plan was not adopted, elements of it found their way into the Articles of Confederation and the Constitution. In 1757, he was sent to England by the Pennsylvania Assembly as a colonial agent to protest against the political influence of the Penn family, the proprietors of the colony. For five years he remained there, striving to end the proprietors' perogative to overturn legislation from the elected Assembly, and their exemption from paying taxes on their land. His lack of influential allies in Whitehall led to the failure of this mission. In 1762, Oxford University awarded Franklin an honorary doctorate for his scientific accomplishments and from then on went by "Doctor Franklin". He also managed to secure a post for his illegitimate son, William Franklin, as Colonial Governor of New Jersey. During his stay in London, Franklin became involved in liberal politics. He was a member of the Club of Honest Whigs, alongside radical thinkers such as Richard Price. In 1756, Franklin became a member of the Society for the Encouragement of Arts, Manufactures & Commerce (now Royal Society of Arts or RSA, which had been founded in 1754), whose early meetings took place in coffee shops in London's Covent Garden district, close to Franklin's main residence in Craven Street (the only one of his residences to survive and which is currently undergoing renovation and conversion to a Franklin museum). After his return to America, Franklin became the Society's Corresponding Member and remained closely connected with the Society. The RSA instituted a Benjamin Franklin Medal in 1956 to commemorate the 250th anniversary of Franklin's birth and the 200th anniversary of his membership of the RSA.